* Download trial version and Save 10 items from each folder. These days email migration has turned out to be the most common trend as many businesses are changing their respective needs and to deal with various cost-effectiveness and data management matters opting out tasks like switching of emails from one platform to another. Read More..
We migrated from Lotus Notes to Outlook this past January. We used the Kernel application to migrate old, archived Notes email to Outlook. Once the emails were in the PST format, we were able to add them to the new online Outlook archive. A great tools. It helped us convert the Lotus Notes database (.nsf) to Outlook (.pst) in a migration of more than 3,000 users. The software migrates NSF files from both IBM/Lotus Notes and Domino Server. In the case of Domino Server, users have the option to search for the Domino Server. Also, they can add one or more NSF files for migration. Users can perform either manual migration or automated migration (using a CSV file) to export multiple NSF mailboxes at a time. This bulk migration of Notes and Domino Server NSF files helps to save time and effort. Kernel for Lotus Notes to Outlook saves NSF files (Notes/Domino Server) in Outlook PST or Exchange Server. Users can also save the data in Text/HTML format or RTF format (Low Quality/Best Quality) with varying migration speeds. With this tool, users can filter mailbox data by a date range. Also, they can skip folder name 'All', skip hidden views and folders, include/exclude folders & select/unselect item types and mark all messages as read/unread before migration. This tool has the option to save the NSF data in multiple PST files (of any desired size). So the output PST files are easy to manage and less vulnerable to corruption. They can be imported in any version of Outlook or Exchange Server. This NSF to PST converter supports even the latest versions of Exchange (2016 & 2019), Outlook (2019), and Notes (10). Also, it can be installed on Windows 10. So users can perform NSF to PST conversion in any environment. Kernel for Lotus Notes to Outlook has a user-friendly interface, and it allows NSF to PST conversion in 3 simple steps. PreviewSelect the required NSF folder to get a preview of the emails content. SaveLotus Notes to Outlook migration in process. How to convert Lotus Notes NSF file to Outlook PST format with the help of the software? Does Kernel for Lotus Notes to Outlook require the installation of Lotus Notes before conversion? Yes, it would. The tool requires the installation of Lotus Notes application before converting NSF files to PST file. 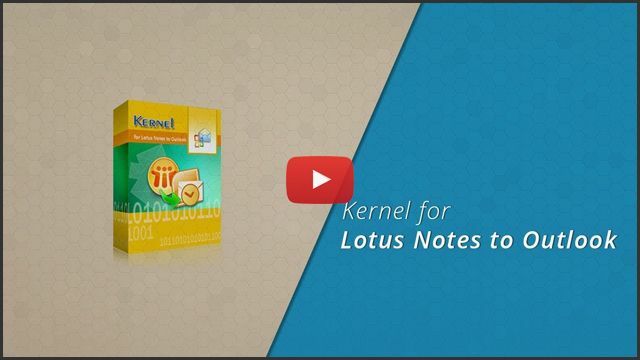 What version of Lotus Notes does Kernel for Lotus Notes to Outlook support? The tool supports all versions of Lotus Notes including Lotus Notes (IBM SmartCloud™ Notes®, IBM® Verse, 10, 9.0.1, 9.0, 8, 7, 6) and Lotus Notes Domino Server (10, 9.0.1, 9.0, 8.5, 8.0, 7.0, 6.5, 6.0). It also supports all versions of MS Outlook (including 2019) and Windows OS (Windows 10). Can I convert Domino Server files (NSF) to MS Outlook? Yes, you can. The tool supports both Lotus Notes as well as Domino Server files (NSF) and allows you to conveniently convert them to PST files. Can I export NSF file data to Exchange Server? Yes, you can. Kernel for Lotus Notes to Outlook software is an advanced migration tool that allows smooth migration of NSF file to PST as well as Exchange Server. Does the tool marks status as read or unread for specific messages? No, the options are Mark all messages as read and Mark all messages as unread. So, there is no provision to mark specific messages as read/unread. Does the tool support batch migration of NSF files? Yes, it does. The tool facilitates the option to add unlimited number of NSF files at once to migrate to the desired destination. Also, you can add multiple NSF files using CSV file (excel sheet) for an effortless NSF to PST migration. Can I preview NSF database items before conversion? Yes, you can preview NSF mailbox items before its migration in both trial and full version. What are the saving options provided by the tool? You can convert NSF files to PST, TXT, RTF file formats. 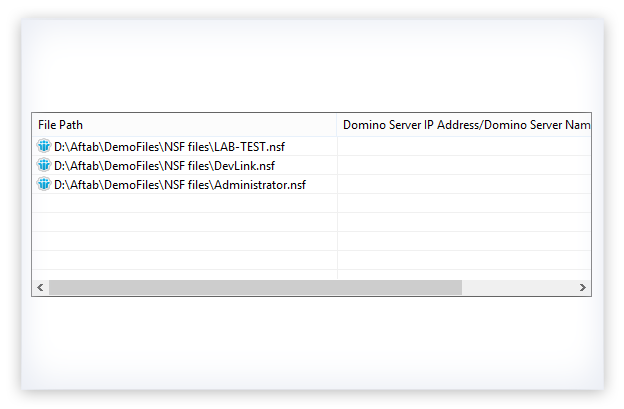 Also, it allows to export NSF files from Domino Server or Lotus Notes to Exchange Server. Can I export mailbox folders selectively from NSF to PST files? Yes, you can. The tool has advanced filters that allow migrating selected items or folders from source to destination. The items can be filtered based on specific date range, categories (mails, Contacts, Tasks), and using other email filters like folders exclude/include options. You can also save NSF data in multiple PST files. Can I convert NSF emails to PST using the demo version? Yes, but only limited items. The demo version is designed for evaluating the software before making the purchase. 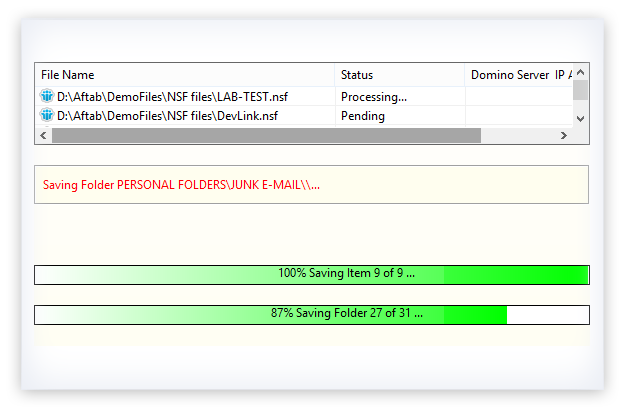 It allows full preview of NSF data including emails, calendar items etc., but allows to save only 10 items from each folder of Notes/Domino NSF file to PST file. To unlock the saving restriction, you've to upgrade to license version. Choosing the saving mode and the desired option. The latest version of Kernel for Lotus Notes to Outlook is released! Good news for Lotus Notes users who want to migrate to Outlook. Kernel for Lotus Notes to Outlook has got an update (version 19.2). The new version includes a feature which allows users to mark messages as read or unread after migration. It now has advanced algorithms that provide improved speed in migration and saving of data. Some minor issues have been fixed to improve the calendar saving performance in Notes to PST migration. The latest version of Kernel for Lotus Notes to Outlook has been released (version 19.0). This updated version offers some extensive features, such as enhancement of software filters and better migration speed. The latest update allows easy migration of Domino Server files to Exchange/Outlook. Also, the sender and receiver email address display has improved now. With these improvments, the tool is more useful for its users now. Another version of Kernel Lotus Notes to Outlook has just been released. This version, 18.5 is improved with better migration speed. And, some minor bugs have been fixed to make the migration process swifter. The new version ensures complete migration of metadata like From, To, Cc and Bcc. With these new enhancements and improved algorithms, the tool facilitates complete and secure Notes to Outlook migration. Kernel for Lotus Notes to Outlook gets an update. In the new version 18.4, the user interface of the tool has been simplified. Users can now easily use a CSV file to perform the bulk migration and map the source mailboxes to destination mailboxes. The free version of the tool now migrates 10 items per folder from both Lotus Notes and Domino Server NSF files. The new version performs better and supports latest versions (including Exchange 2019) for migration. Kernel for NSF to PST is out now with its new upgraded 18.1 version. The software has several improvements to ensure smooth migration. It has a more user-friendly GUI and it works smoothly with all the latest software versions. The latest version of Kernel for Lotus Notes to Outlook 17.2 has been released with many significant updates. Now the post-migration quality of embedded attachments, images and other mail content has improved remarkably. The conversion of Contacts and User groups has become quite smooth. Users can easily convert a number of user groups containing the contact information. Additionally, the new version of the tool offers better Unicode language mail conversion. The latest version of Kernel for Lotus Notes Outlook (17.1) has been released with many performance enhancements. The tool now offers smoother conversion of large NSF files and NSF files having large messages. After some minor bug fixes, the selection of date from the calendar (for the filtering of mailbox data) has become easier. Overall, the new version ensures quick and effortless Notes to Outlook conversion. Lepide Software today released the new version of Kernel for Lotus Notes to Outlook software (17.0). This version comes with some new features and offers enhanced performance. The software introduces a PST split feature to split large-sized PST files after reaching the user-defined file size. The latest release offers more efficient batch migration and selective migration of mailbox folders & item types. Also, the new version supports Exchange 2016, Outlook 2016 and Lotus Notes 9.0. Lepide Software Pvt. 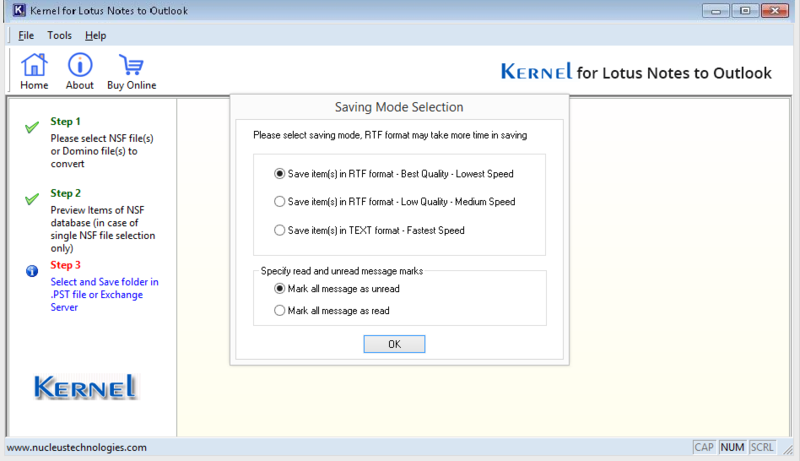 Ltd. announces the release of refined version 15.8 of Kernel for Lotus Notes to Outlook. The latest version 15.8 is equipped with intuitive email filters that can assist users perform the Lotus Notes migration by extracting the specific folders and items. Moreover, these agile filters can accurately export specific emails that falls under specified date range. Also, the upgraded version 15.8 is fully compatible with Windows 10, 8/8.1, MS Outlook 2013, 2016, and MS Exchange Server 2016. Lepide Software successfully launched Kernel for Lotus Notes to Outlook Version 14.07.01. The upgraded version of the software has got a high interactive GUI and at the same time offers extended support to Windows 8.1. It facilitates instant Lotus Notes to Outlook migration and provides improved migration capabilities for MS Outlook 2013. Lepide Software Pvt. Ltd. announces the release of updated version of Kernel for Lotus Notes to Outlook. The new revised version 13.04.01 is intelligently programmed and supports 2013 edition of MS Outlook to complete the NSF to PST conversion process. The new version is easy to operate and now very much compatible with Windows 8 OS. Updated version of Kernel for Lotus Notes to Outlook is now equipped with more powerful migration algorithms which performs the migration and enumeration of domino server files more quickly. Software now supports migration of Unicode folder names while saving the folders. Updated version of Kernel for Lotus Notes to Outlook software released today. This update being master of the previous release is more robust, attractive and user friendly in terms of navigation and migration process. Nucleus Data Recovery releases updated version (8.03.02) of Kernel lotus Notes to Outlook - NSF to PST conversion software. The upgraded version equipped with magnificent and highly performable features is all set to break records in the email conversion market. Converts everything from emails, images, contacts, calendar, attachments, to-do item list, sent emails, alarms, rules, group calendars, folder and sub-folders, drafts, message properties, email data to complete formatting of the email. Free to evaluate version now displays complete preview of the converted NSF file which was limited in previous version. Attractive and easy to use software interface, result oriented features plus reliable performance of Kernel Lotus Notes to Outlook makes it stand differentiated from other exchange migration software. Nucleus Data Recovery today announced the release of Kernel Lotus Notes to Outlook software. The NSF to PST Conversion software is a perfect tool when you need to convert Lotus Notes (.NSF) files to MS Outlook (.PST) files. 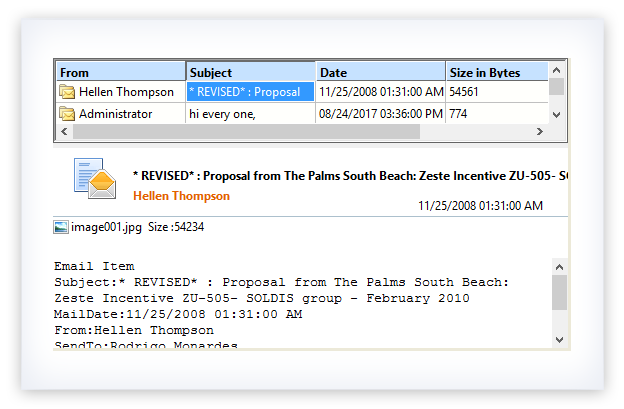 Software quickly performs the NSF to PST operation and lets you view Lotus Notes emails with MS Outlook. Equipped with two conversion modes you can convert single or multiple .NSF files at a time. The idea of migration was based on quick accessibility and technical divergence features observed in Outlook platforms. German Sales Agency was not in condition to lose the data as there was no backup available. Instant migration of multiple Lotus Notes/Domino NSF files to Office 365. Export Lotus Notes/Domino Server Contacts to Outlook PST & Excel files. Instant exportation of Notes/Domino server calendar entries to Outlook/Excel.